Drontal Puppy Suspension 100ml is an oral worming treatment indicated for use in puppies. 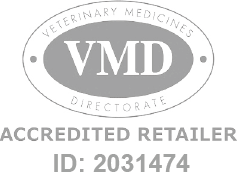 Drontal Puppy Suspension - 100ml is a Prescription Only Veterinary Medicine and by law requires a prescription from your vet. Wormer for puppies. For the treatment and control of roundworms of puppies and young dogs up to one year of age, it is also effective against hookworm and whipworm. Dosage: 1ml per kg bodyweight.